Own a piece of Hyrule in a fun new take on the classic property trading board game! The Legend of Zelda Monopoly Edition includes 6 iconic playing tokens and memorable Hyrule locations to buy, sell and trade. Look no further than this mini warp pipe planter to decorate your desk or gaming room! Made out of high quality plastic, the Super Mario Bros inspired planter will make a fantastic addition to any fan’s home or office. Tote around what you need for the day with the help of everybody’s second favorite plumber. This super Luigi backpack features adjustable straps and a zipper pocket on the back that’s great for storing small items such as coins and magical mushrooms. 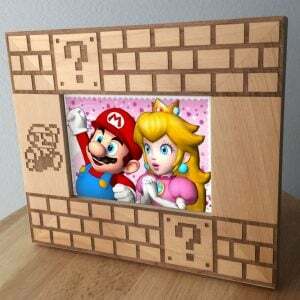 Transform any room into Super Mario Bros Mushroom Kingdom! This mystery box shelf has been hand painted to replicate the bricks and question mark blocks with a door that swings open to create the perfect place for hiding secret objects!